In some obese men, certain genes seem locked. Each individual's phenotype, his "vulnerability" towards over nutrition or malnutrition, and his capacity to react at a given moment, are only partly conditioned by his genetic heritage. During development, something is added to the genetic heritage, an epigenetic processes program, itself under the influence of a multitude of environmental factors, to start with the intra-uterine environment. The studies undertaken among monozygotic twins and dizygotics shows the following: propensity to put on weight in an obesogene environment is caused massively by heredity, estimated to 70% and even 80%. The hereditary aspect of this vulnerability, its polygenic component, rest partly on the genetic inheritance of the father and the mother. To this share, purely genetic, during the development of the child an epigenetic misprogramming is added partly, due to potential noxious but so protective effects of the intra-uterine environment: obesity, diabetes, or stress and unbalanced nutrition of the mother represent many factors of influence. In the same way, after birth, breastfeeding or too important protein intakes will modulate the gene expression of the infant. Then, during life, the environment will behave as an essential "revealing" factor of this at the same time innate and acquired "vulnerability" (precociously). This vulnerability extends sometimes to the next generations: epidemiologic studies on man, and on experimental animal models show that certain influences of the environment (food, endocrine disturbers, toxic, smoking...) undergone by the former generations could also be conveyed thanks to non unobtrusive epigenetic markers from one generation to the other responsible of trans-generational effects. Thus, there are certain elements of heritability which are not transmitted through modifications of the sequence of the DNA but by somatic and/or germinal deteriorations non unobtrusive epigenetic of one generation to the other. Whereas misprogramming during development can imply an abnormal uterine medium spreading the disease risk through a vicious circle of transmission mother-daughter - with epigenomic deteriorations at the somatic level - there are also examples of transmission through the paternal and maternal gene line, with a sexual dimorphism for the transmission as well as for the trans-generational effects. Thus, epidemiologic studies on men, and on experimental animal models show that certain influences of the environment (food, endocrine disturbers, toxic, smoking...) undergone by the former generations could also be conveyed thanks to non unobtrusive epigenetic marks of one generation to the other responsible of trans-generational effects. Whereas these effects during the development are well documented in animals (very little in men), we still do not know very well the mechanisms related to the appearance of epimutations occurring in a stochastic way (i.e. random), epigenetic and under the influence of environmental factors throughout the life of an individual. 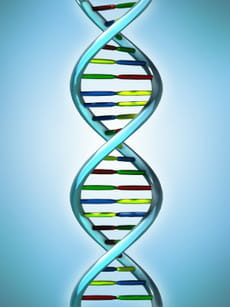 Contrary to the transfers in the sequence of the DNA which are irreversible, the epigenetic modifications are, in theory, unstable and reversible. They are thus transitory in everyday life: during the day, the gene expression for example is modulated by the molecular signals of the circadian rates as well as by the nutritional signals, with the liking of the diversity of the whole of environnemental stimuli. Nevertheless, epimutations can accumulate during time and come to heavy the genetic and epigenetic burden of an already vulnerable individual leading to the appearance of pathologies related to ageing and/or the environment. According to the nature and intensity of the disturbance, the critical spatiotemporal windows and the development of the processes implied throughout the life, these epigenetic deteriorations can lead to permanent changes in the structure and the function of the organs and tissues; but it is also possible that some of these specific gene changes, of stage or of tissue are reversible using suitable epigenetic tools. We know many examples in animals but also in men (tumour, schizophrenia) of epigenetic modifications obtained thanks to nutrients or drugs acting on the epigenetic machinery and being able to involve the reversion of a phenotype. But there are still exceptions: a too early "misprogrammed" organ will be with difficulty "recoverable". Whereas a mouse made obese by a diet rich in energy loses easily and quickly its excess of weight under a normal diet, a obese man seems much more refractory, as if certain genes "were definitively locked" or as if key tissues had undergone irreversible deteriorations. Whereas prevention can be linked to behaviours with the risk referred to above, obesity treatment will also have to attack unlocking! There is already a certain number of encouraging clinical trials or experiments in animals, showing that the prevention or the processing of these affections dependant on age or certain behaviours is possible. However, these types of operations will require intense research efforts to include the complexity of these interactions between the epigenetic role, genetics and the environment to evaluate their potential reversibility by minimising undesirable effects. Because of the importance and the increase in the proportion of women who are overweight (25% according to Obépi 2006) and with a bad eating habits during pregnancy, it becomes urgent to be interested in these fetuses rather than those of light weight or diabetic mothers. Improving the environment to which the fetus is exposed during its development becomes as important as any other public health effort aiming at improving health in general. Latest update on April 11, 2010 at 01:39 PM by owliance.en_ctrl_002. This document, titled "When environment modulates the gene expression," is available under the Creative Commons license. Any copy, reuse, or modification of the content should be sufficiently credited to CCM Health (health.ccm.net).